Heat oven to 350°F (325°F for dark or nonstick pan). Make, bake and cool brownie mix as directed on box. Reserve half of cooled brownies for another use. Crumble remaining half of brownies. 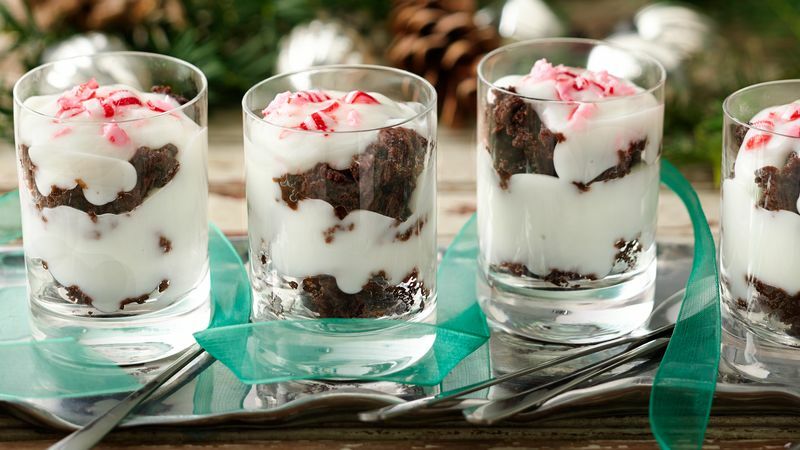 In each of twelve 2-oz shot glasses or mini dessert dishes, layer crumbled brownies and yogurt. Serve immediately, or refrigerate until serving time. Just before serving, top with crushed candies. Look for tasting-size dishes or shot glasses in the housewares departments of department stores, or use any small glasses you have on hand. Instead of crushed peppermint candies for a garnish, reserve 2 tablespoons of the crumbled brownies to sprinkle over the yogurt.